Are you looking for ways to create your own embellishments? Today's rolled flower tutorial can be used on cards, altered projects, and layouts. Just change the size of your starting circle to accommodate your specific project. Today's tutorial is going to teach you how to create rolled flower embellishments. This is a fun & easy way to jazz up a layout, card or even to create an entire bouquet. 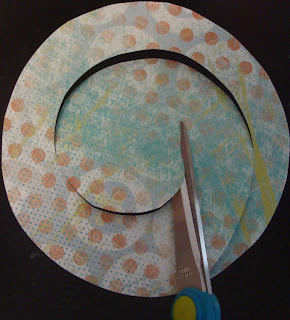 Cut out 2 1/2" circles from patterned paper. 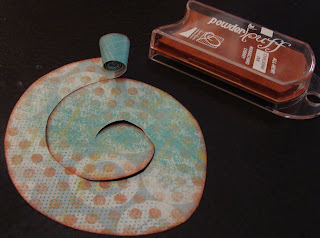 Then use scissors to cut in a spiral pattern towards the center. Ink the edges of your cuts so this way the layers will pop once you roll it. Then starting at the outside, roll the paper trying to keep the bottom portion level/flat & tight. The top can expand more since this will be the opening of your flower. To make a bouquet: Glue one foam ball into your base, then connect your two foam balls using the wooden dowel. Add the flowers to the top foam ball until full. Wrap ribbon around the dowel and layer/fold ribbon over the bottom foam ball until hidden (glue into place). 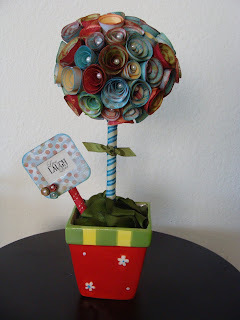 This project was voted photo of the week at Scrapbooks Etc. in May 2011.
amazing project lisa!!! thanks for sharing this! This is a super cute project!!! As a slight variation you can cut a sort of bumpy edge along the outside edge of your spiral and then roll up. Pretty cute too! :) Thanks for sharing! Thanks for sharing the wonderful flower idea. @Annie - thanks for adding that in. I have tried rolled flowers with cute borders in the past too!! Woohoo - we hit 1000 followers!!! So exciting!!! Banners, and the whole topiary, flowers although we all use them most in general know how to make them.? I'd like to see some newer things. Oh My Word...FABULOUS! The array of colors in the finished bouquet are gorgeous. TFS the tips! If you have an idea of something you'd like to see or an idea that you'd like to share with us, please send me an email. love this tip! Beautiful bouquet! Beautiful topiary Lisa! I love how it turned out. Thank you so much for that wonderful tutorial. Very clear and easy to understand!